With the anniversary of Emancipation Day drawing nigh, the first since the end of the war, Southern whites in the region’s cities are on alert. 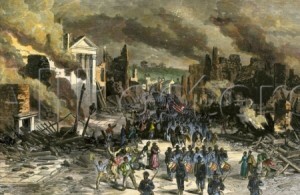 A number of Christmas racial day riots in cities across the South have amplified fears that former slaves may cause trouble. 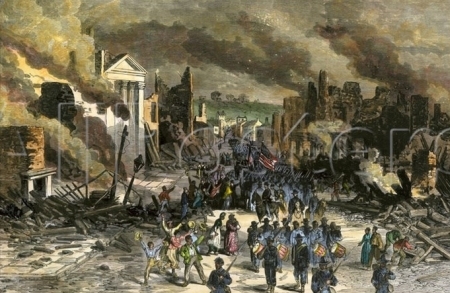 In Richmond, the former Confederate capital of which whites yet seethe over Union victory and the black troops who marched into the fallen city, white leaders take great pains to recast the Christmas riot in Alexandria, Virginia as a result of black aggression, rather than white bullying of former slaves. For the latter reason the rioting commenced, but a revisioning of the incident, originally published in the Baltimore Gazette and re-published this day in the Richmond Daily Dispatch, allows for the purging of white guilt. The revisioning has just begun. White hatred of blacks, to be evidenced in countless acts of terrorism against African Americans over the next one hundred years, will systematically be cloaked by mythological history and smoothed over with a religious veneer. White Baptists are, and will remain, as guilty as anyone.